Our mostly-weekly survey of the tidbits that cross The Eight-Year-Old’s desk. This week, The Eight-Year-Old reads every Horrible Harry book on her teacher’s bookshelf except one. Harry loves to do horrible things, and The Eight-Year-Old loves to read about him doing it. 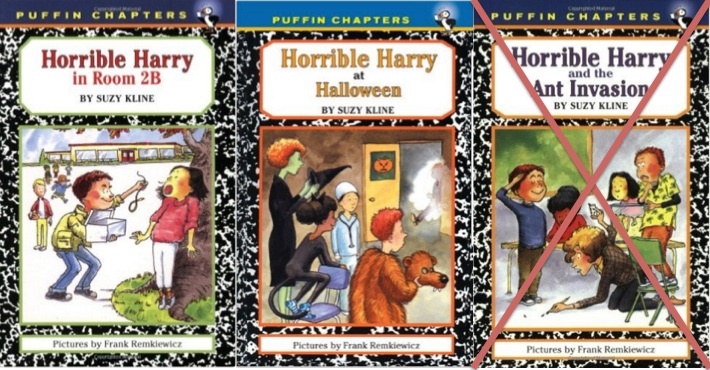 Every day this week, she brought home a different Horrible Harry book from the stash in her third grade classroom, and every day I heard her giggling her way through them all. Except for yesterday. Yesterday’s book was Horrible Harry and the Ant Invasion, and The Eight-Year-Old didn’t enjoy that one much at all. Note to parents: Although two of our stories come from it this week, Huffington Post is not a site you want your kids browsing on their own. interesting the title is “this week” and the frequency is monthly.